'Rancho Grande' (Joseph Ghio, R. 1987). Seedling# 83-7-D3. TB, 35" (89 cm), Early midseason bloom. Standards mocha brown; falls honey mocha; honey beard. (('Financier' x 'Temple Gold') x 'Speculator') X 'Speculator'. Bay View Gardens 1988. From Bay View Gardens catalog,1988: RANCHO GRANDE, 34 inches, EM. $35.00. 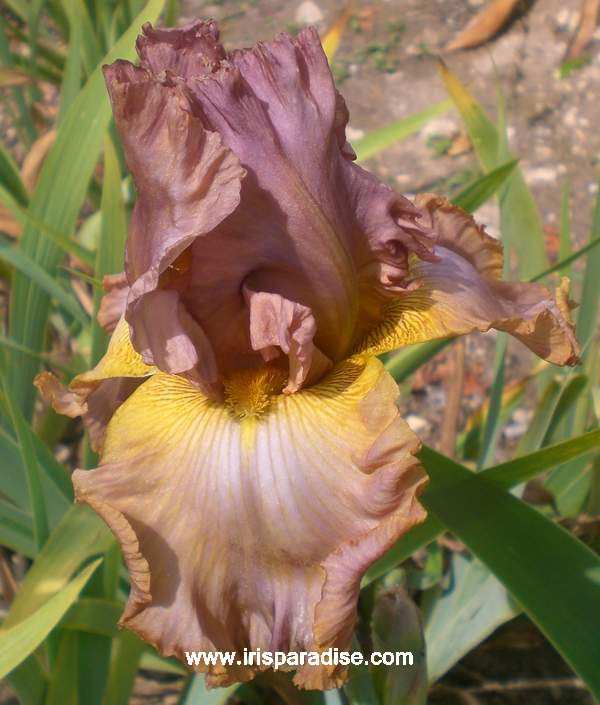 A magnificent bloom showing its strong Speculator heritage: Semi-flaring form, generously edged with scalloped ruffles. The domed standards are honey tan, and the wide falls are lighter toned honey mocha; a large splendid reverse bitone. Free flowering, very vigorous, with a tendency to send up auxiliary stalks late in the season. No. 83-7-03: ((Financier x Temple Gold) x Speculator) X Speculator. jpg BHP_0542-X2_rancho_grande.jpg manage 165 K 20 Feb 2016 - 06:47 BrockHeilman Please contact Brock Heilman for image use.